Laodicea is a very large mound located to the north of Denizli. It was founded by Seleucid kings during the third century B.C. By the New Testament era it was a very large and very important city. It had evidently replaced both nearby Hierapolis and Colossae as the most important city in the area. It was located near good water sources although an aqueduct brought water to the city from the south. Most importantly it was located at a key road junction. The major road coming from the east (Syria, Mesopotamia, Arabia, India, China) came to Laodicea and from there one could continue west, 112 mi. [180 km. ], to the port city of Ephesus, or head northwest towards Philadelphia from where roads headed either west to Smyrna, or continued northwest to Pergamum. 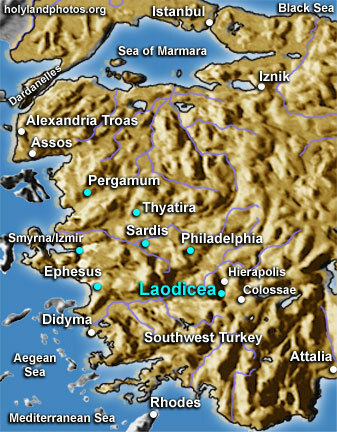 From Laodicea, one could also travel southeast to Attalia, a port on the Mediterranean Sea. It is probable that Epaphras was instrumental in establishing the church at Laodicea, and Paul writes that his letter to the church at Colossae (only 8 mi. [13 km.] distant) should be read by the believers at Laodicea (Col 2:1). Paul also wrote a letter to the church at Laodicea (Col 4:16). This letter has not been discovered, although many scholars speculate that the book called "Ephesians" was originally addressed to the church at Laodicea. Laodicea is the last of the seven churches addressed in the book of Revelation (1:11; 3:14–22). In the letter there may be a number of allusions to the local setting of Laodicea: the lukewarm water, riches, gold, white garments, and eye salve! (see The Letters to the Seven Churches of Asia in their Local Setting by Colin J. Hemer; click here to view for purchase from amazon.com). A convenient source for information on Laodicea is, the unfortunately now out of print, Yamauchi, E. The Archaeology of the New Testament Cities in Western Asia Minor. Grand Rapids, MI: Baker, 1980.